Great looking and so practical. There is one shelf in the cupboard. 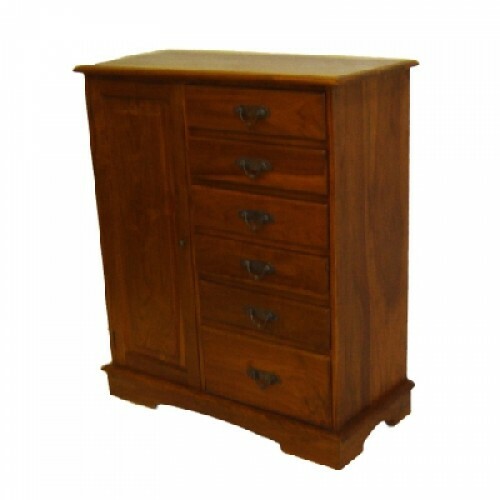 This Teak Chest is made in Indonesia and is 100% solid teak. All the doors, sides and backs are solid teak. The drawer boxes and bottoms are solid teak and the back panels are fielded. The Teak Chest is pre built and cannot be dismantled. Please check the dimensions and ensure that you can get each piece into your home and into the room of choice. 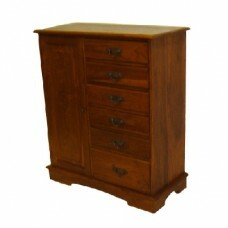 This chest is 100% natural timber and, as such, there may be slight shade and grain variations. This range represents the best quality at really sensible prices.